We rounded off a busy and sucessful summer season with a great concert at Spa View Community Church last night. It’s the first time we’ve played there and have to thank Chris Slater and all the team at the church for the invitation. It was a packed hall and we even got a standing ovation at the end! Thanks very much to our deps Lewis and Jason (both from Unite) for their help and thanks to our principal euphonium player Dan for agreeing to switch to solo trombone for the night. 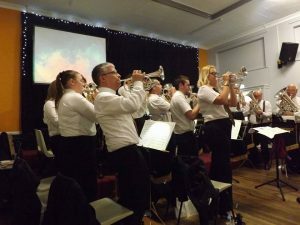 The audience were treated to a program of rock and pop classics as well as some more mainstream brass band music including Bohemian Rhapsody, Mr Blue Sky, Karma Chameleon, Make You Feel My Love and Mid All The Traffic. There was also a special arrangement of a song that the congregation sing frequently done especially for the event. We rounded the evening off with Philip Harper’s arrangement of Hawaii 5-0 which finishes off with all the Band on their feet – a fitting end to a great evening. The Band are in action next on Remembrance Sunday where we’ll be leading the Parade in Eckington followed by the service in the Parish Church.